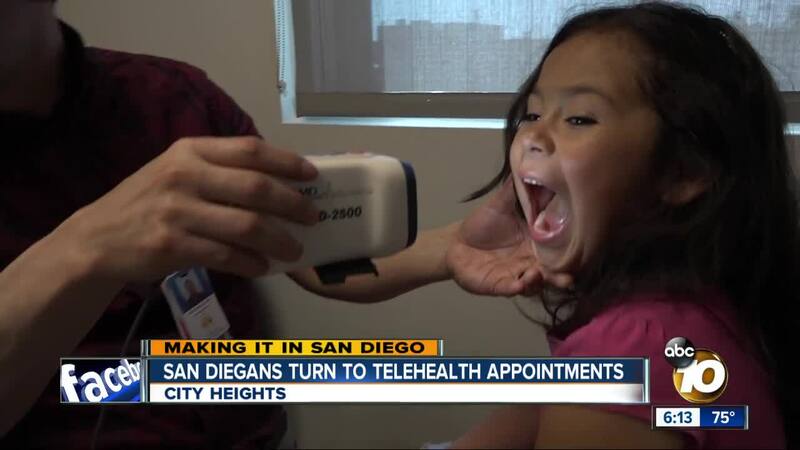 More and more San Diegans turn to telehealth appointments to cut costs. SAN DIEGO (KGTV) - Amid rising health care costs, some San Diegans are turning to telehealth appointments. On a Monday afternoon, young Josephine sits in an exam room. She's come down with cold-like symptoms after recovering from enlarged tonsils. So her mom, Josie Ruiz, brought her to their neighborhood clinic, La Maestra Community Health Center in City Heights. For this appointment, one doctor is waiting in the exam room, and another is on a computer screen. Dr. Anthony Magit is an Ear, Nose and Throat specialist and pediatrician at Rady Children's Hospital. As he watches from his office, the clinic's Chief Medical Officer, Dr. Javier Rodriguez, conducts an exam. Cameras and camera-equipped scopes feed real-time data to the specialist, who then asks questions. The exam is part of La Maestra's telehealth program, which offers virtual appointments to underserved patients. "Before telehealth, my previous appointments ... some of them I had to cancel or reschedule," said Ruiz. Ruiz is a single mom who works full time. "This is great because in my case I don't have to request a day off to take her to the hospital, which I can't afford to do," said Ruiz. Most of the patients at this clinic don't own cars. For them, getting to Rady Children's Hospital means hours on buses, which can lead to major issues related to work and child care. Six years ago, doctors at the clinic discovered many referrals to Rady Children's Hospital weren't showing up. That has changed. No-show rates went from about 50% to 13% within two years. Across the county, other hospitals are tuning in to telemedicine, from home appointments for rural patients to consultations with specialists across the country. In some cases, the only doctor is on a screen.